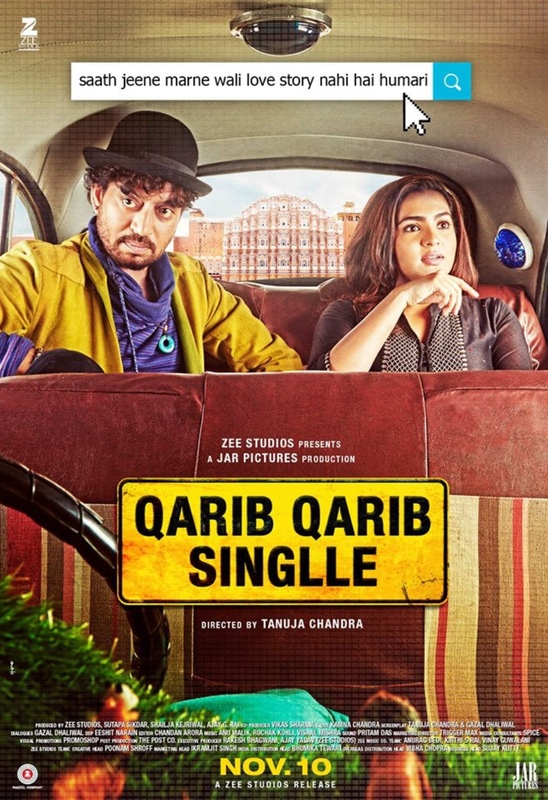 Look, there are lots of problems in Qarib Qarib Singlle. As there are in life. But that’s what makes life , and life in the movies, worth living. 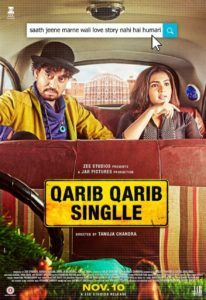 Qarib Qarib Singlle(QQS) is a delightful ‘romp’-com about two middleaged strangers, one a widow – the other a vagabond, travelling together to meet his ex-girlfriends. Don’t giggle. Nothing new here. But then if you want something new, please visit your nearest mall and buy yourself a fresh coat of paint for your living room. Movies make sense only when they bring us characters we know in ways that we never knew that we knew them. And I can swear I have met Yogi and Jaya somewhere. The fact that they are played by Irrfan and Parvathi (who is a prized find for Bollywood) is just so providential for director Tanuja Chandra. The director gets the best possible actors for the two principal parts. I can’t imagine what Yogi and Jaya would have been like had they been played by George Clooney and Meryl Streep. What follows after the flawless casting for the flawed protagonists is sheer serendipity, as Yogi and Jaya, so mismatched they make chalk and cheese appear like long-lost twins, take off on a journey that they, and we, can never forget. More than anything else it is just so refreshing to meet protagonists who are over-the-hill and not afraid of the view on the other side….At least not afraid to peep with brazen curiosity to see what lies in store after middleage. So I was telling you about Jaya and Yogi. Jaya is a 35-year old widow and Yogi is an obnoxious chipkoo, a human leech who just doesn’t know when to stop trying to get the other person’s attention. In real life we avoid the Yogis although we know they are helpful, kind, generous, considerate and well-meaning. Irrfan pulls out all stops to play Yogi. He redefines the word ‘obnoxious’ , and manages to make Yogi endearing, like a distant benign loud and crass cousin who makes politically incorrect ambivalently sexist comments sounds plausible and acceptable. I doubt any actor except Irrfan could have played Yogi so honestly. Irrfan has a terrific co-star in Parvathy, a well-known name from Malayalam cinema, she plays Jaya with the right doses of insecurity and swagger, pulling in her breath when tense, exhaling exuberantly when relaxed, making Jaya one of Bollywood’s first post-30 heroines whose insecurities define rather than obstruct the free flow of feistiness. There are memorable cameos dotting the devilishly flippant plot. Sidharth Menon as Jaya’s brother on Facetime, is a part that shines for its writing. Navneet Nishan as a ditzy gossip-monger shows up twice with lumbering languor. And the wonderful Brajendra Kala is terrific in a cameo as a hotel receptionist wondering if he should allot a single or a double room to Yogi and Jaya. Though we know how this would end (movie hai na, baba) we get sucked into Yogi and Jaya’s crazy Bharat Darshan, probably because we have all been in such situations thrown together with people whom ideally we would avoid. Also, the journey is so strikingly captured. Cinematographer Eeshit Narain makes Hardwar, Rishikesh, Gangtok and even Rajasthan look inviting enough to make us want to leave everything behind and rush for a vacation. But not now,please! There is business yet to be finished between this…this…criminally unmatched couple who seem to share nothing in common except trains, planes and taxis. Speaking of taxis, there are two interesting cameos by chauffeurs whom Irrfan’s Yogi insists on calling ‘Betaji’ and who, again, like much else in the film are people whom we’ve all met at some point in life. The film persistently strikes up conversations we have had, or overheard somewhere or the other. Tanujaa Chandra’s film doesn’t simply touch your heart. It runs against the most sensitive portions of the heart, tugs and pulls at your emotions in ways that are far from manipulative or gratuitous. Yes, some portions after the midpoint get repetitive. The narrative tends to sag in parts. But nothing that Irrfan and Parvathi can’t swoop up in their arms and revivify. QQS is a gloriously joyous journey into the heart and the heartland. It is refreshing to come across a film where the protagonists sound neither over-rehearsed nor strenuously casual. The conversations are real. Mercifully when these protagonists talk or sing they are not afraid to make mistakes. And yes, get ready to fall in love with that vintage Amit Kumar –R D Burman number Bade achche lagte hain all over again. 15 queries in 0.579 seconds.